Can the game live up to the hype? Highly anticipated: Cyberpunk 2077 has been on the minds of gamers since it was first revealed back in 2013, but it wasn't until the game's re-reveal at E3 2018 that the hype machine truly kicked into gear. While no public gameplay has been shown so far, CD Projekt Red has treated journalists and select industry influencers to 50-minute, private demonstrations of the game, and it sounds awesome. Polish game development studio CD Projekt Red (CDPR) has been working on their highly-anticipated futuristic title, Cyberpunk 2077, for quite some time now. The open-world RPG was kept almost entirely under-wraps since its first cinematic teaser debuted in 2013, but the silence was finally broken at E3 2018. While the public was only shown a short (but intense) trailer containing "in-engine" footage, the press and select YouTube personalities were invited to a 50-minute behind-closed-doors presentation at the convention. Most of the individuals invited to see the private demo were blown away, and now it seems history is repeating itself this week at Germany's Gamescom event. CDPR has once again chosen to privately show off Cyberpunk 2077 to a fresh round of journalists and influencers at the event, and the reception has been just as positive as it was at E3. While we won't summarize the demo as a whole here, we'll go over a few exciting gameplay elements it revealed. For starters, if you were unaware, Cyberpunk 2077 will feature a character creation system - players can choose between male and female avatars, pick their starting attributes, tweak their body type and overall appearance, and even select their backstory and personality via a "lifepath" system. Visually speaking, Cyberpunk 2077 has impressed even the most cynical gaming journalists out there. Demo viewers unequivocally agree that the world oozes a nostalgic, retro-futuristic 80's aesthetic, while still featuring impressive new technology and towering corporate skyscrapers. Flying vehicles, called "Aerodynes," speed by overhead while the player walks around the densely-packed streets. The game's RPG systems are equally impressive. 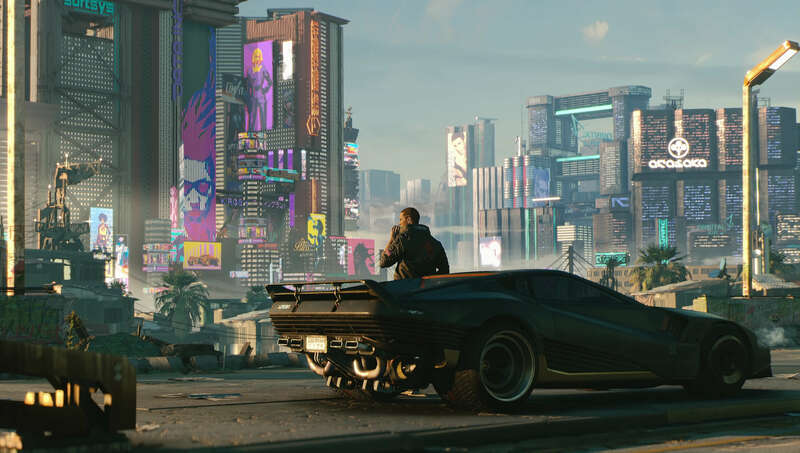 Unlike the Witcher 3, which limited players to perks and gear, in Cyberpunk 2077 players will have access to perks, attributes, skills, and outfits, all of which affect gameplay in different ways. For example, the "Long Gun" skill will determine how effective you are with rifles and snipers, while the unique Cool attribute will determine how the world's inhabitants treat you. As far as Cyberpunk 2077's combat system goes, the pace of encounters will vary quite a bit depending on the player's chosen playstyle. In true "immersive sim" fashion, encounters can be approached in a variety of ways. You can sneak in through vents and knock people out, hack into wall panels to overload them and kill nearby enemies, or simply go in guns blazing. Even within these fairly distinct playstyles sub-playstyles exist. For example, a Rambo-style character can choose to go for melee-centric combat tactics, using magnetic forcefields to deflect bullets while slicing their enemies to bits with a katana, or they can use homing "smart guns" and bullet ricochets to dispatch their enemies. Naturally, not every situation has to end in combat. In true CDPR fashion, Cyberpunk 2077 will let players talk their way out of a fairly large number of encounters. In the demo, the player advanced through a significant chunk of the main mission without firing a single shot by using their wits and a silver tongue. There may be consequences for going this route, but it does seem possible to play as a bit of a pacifist in many situations. "Cyberware" and augmentations are another major part of the Cyberpunk 2077 experience, just as they were in the game's pen-and-paper RPG source material (Cyberpunk 2020). Throughout the game, players will be able to visit "Ripper Docs," who possess the equipment and medical expertise to install body modifications on "V," the main character. These modifications will range from optical implants that let you see enemies through cover to wrist implants that increase weapon stability, both of which were shown in the demo. Some pieces of Cyberware will be mandatory for story purposes, while others will be purchasable by the player seemingly at will. If all of this sounds like your cup of tea and you're eager to get your hands on the game, I'm afraid we'll have to disappoint you. CDPR hasn't even shown the public gameplay of Cyberpunk 2077 yet, much less announced an official release date. However, given the rate at which the company has shared information about their game over the past few months, we'll likely see the first snippets of gameplay before the year's end, or at E3 2019.